Elna 2800. I tried this one at The Life Craft. I quickly felt comfortable using it and it was easy to use. It is just a smidgen too basic for my needs. Elna 3210. I tried this one and the following two at John Lewis. Weirdly enough, I knew immediately this was not the machine for me. I did not like the placement of the reverse key, and I found choosing a stitch more hassle than it ought to have been. Janome Excel II 5024. I like this machine a lot. It is sturdy, intuitive to use, and it comes with a good selection of feet. 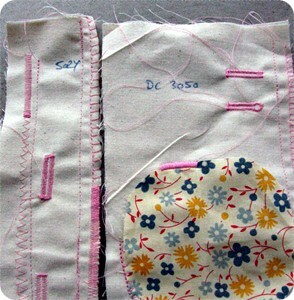 Janome Dec0r 3050. The only computerised machine I tried. It was easy to use, is very versatile, and comes with a good selection of feet. I kept the two samplers I made just so I could compare stitch quality between the 5024 and the 3050. If I knew I were to become a control freak quilter who needed absolute even stitching, I would go for the 3050 in a heartbeat. The 5024 has even stitching, don't get me wrong, but the 3050 has that computerised evenness down pat. I'm just not cut out (boom!) to be a control freak quilter. On the other hand, I'm not sure I'm willing to pay £100 more to get super-even stitching, three buttonhole options, and a whole lot of decorative stitches that I will probably never use. The 5024 is the best mechanical machine I've tried, it does the basics plus a bit more, and it does its thing very well. It is a real workhorse of a machine, and I enjoyed working with it. I just really like that keyhole buttonhole that the 3050 has to offer, dammit. And the machine is just, well, prettier than the 5024. Meanwhile I have been really inspired by all your comments about a Spring-Summer wardrobe. I have also kept a close eye on the Colette Patterns Spring Palette challenge in which people have defined their sewing goals for Spring 2011. I haven't made it that far yet - for obvious reasons outlined above - but I have actually begun to think about cohesive wardrobes and deliberate colour palettes for the first time in my entire life (bar my university years: black with a dash of black for that intellectual look). I created a palette at ColourLovers which helped me identify five colours that will form the basis of my Spring-Summer crafting this year: Citrus colours balanced and anchored by two neutrals (I particularly like the cool brown). Crazy as it may sound, I already have yarn and fabric that reflect this palette but it wasn't until I sat down to play with colours that I realised this. I think having this palette in mind will also help my buying habits. Colourlovers is a great site, actually. Not only does it let you create a palette of your own choice (or find suitable colours created by someone else), but it lets you create a pattern based upon your chosen colours , and then you can transport that pattern to Spoonflower where they'll print your very own fabric. If I were rich, I'd totally design my own freaking wardrobe down to every last detail. I may not be a control freak quilter, but I can still get a tad obsessive at times.